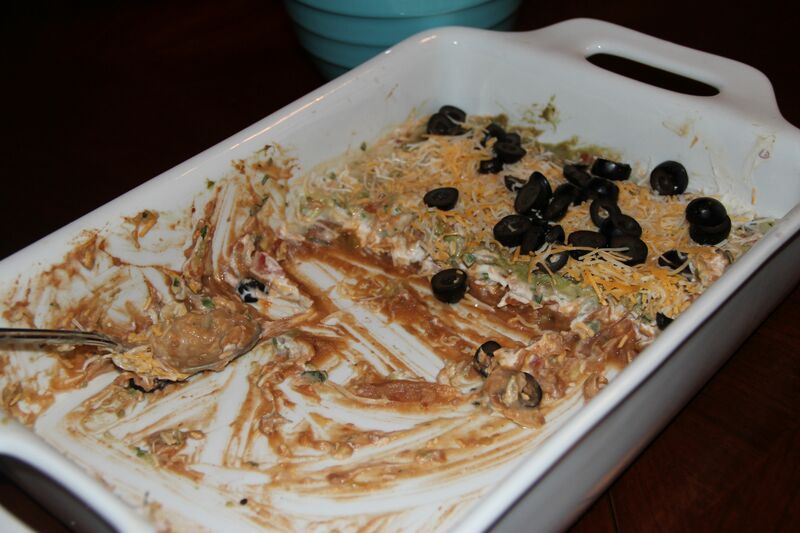 As promised in last week’s post, here is the recipe for the Mexican Layer Dip. 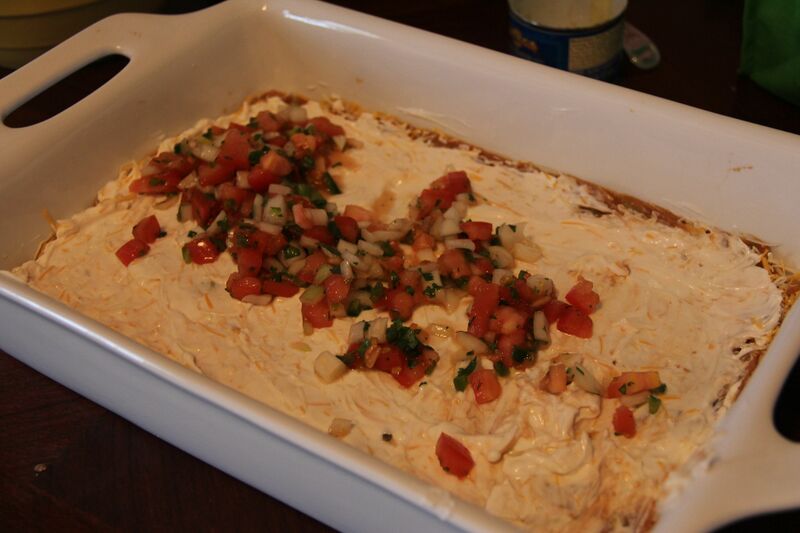 You’ll have to excuse the quality of the photos; as usual, I had underestimated how much time it would take to get the food and myself ready and was rushing through preparing this dip while some of our guests were walkin’ through the door. I’m beginning to think that, no matter how good my intentions, I will never be one of those people who is all dressed and ready to roll, waiting by the door to greet guests with a platter of appetizers. My past experiences lead me to believe that I’m way, way down on the other end of that spectrum: I’m the person who sees your car pull up and tries to get up the stairs to start showering before you see my panicked expression through the window. I could have all day to prepare something or get myself ready to go out and I will still be completely frenzied, screaming at Justin about how we’re going to be late (even though he probably already knows that). I should have made “stop being such a dummy procrastinator and learn to manage your time” a New Year’s resolution but I never got around to it (ba dum tssshh). Is it too late to make resolutions? and some diced green chiles and stir to combine. 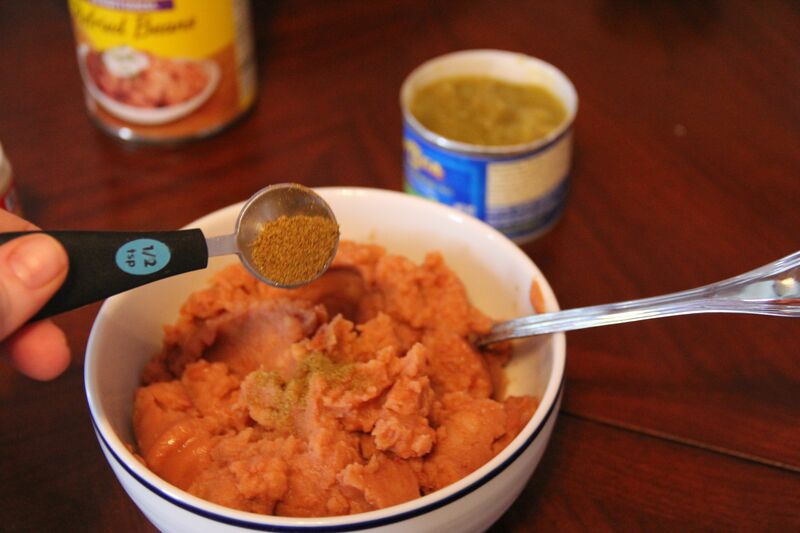 You could also add in some Tabasco sauce if you like a little kick to your dip. Looks a little gross, but power through. It’s worth it. 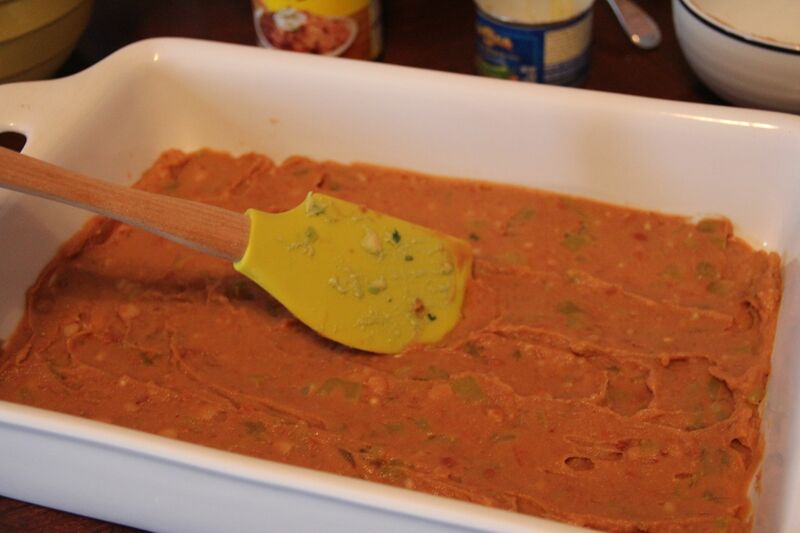 Using a spatula, spread the bean mixture on the bottom of a large, shallow container; I used a casserole dish. 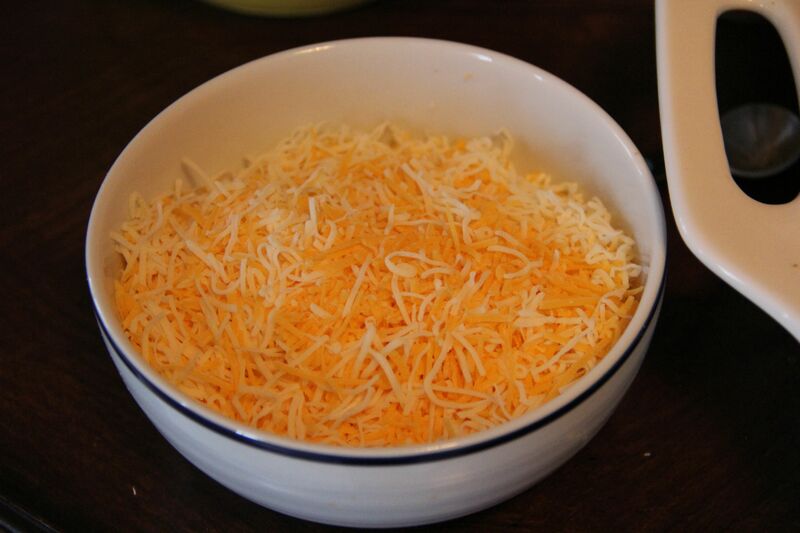 The next layer is cheese. I used a combo of sharp cheddar and Monterey Jack which added some nice flavor. You can also use a Mexican cheese blend or whatever else tickles your fancy. 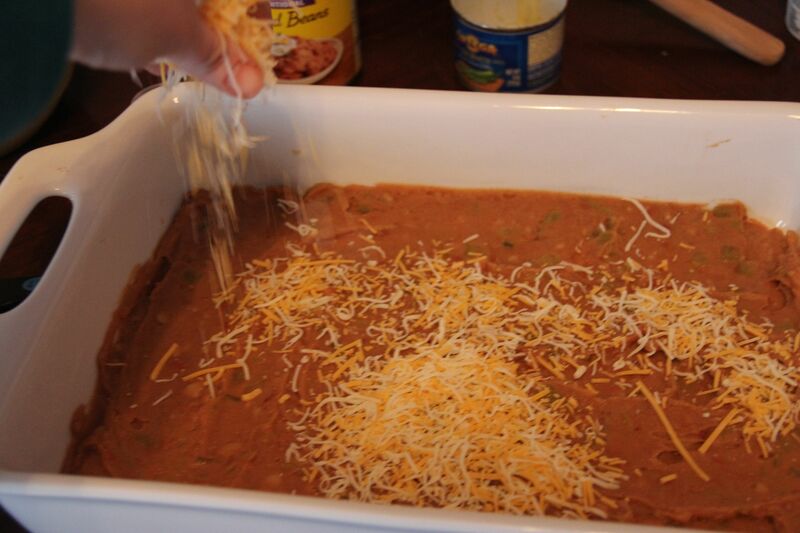 Sprinkle the cheese over the bean mixture. There is going to be another layer of cheese so don’t use it all at once. 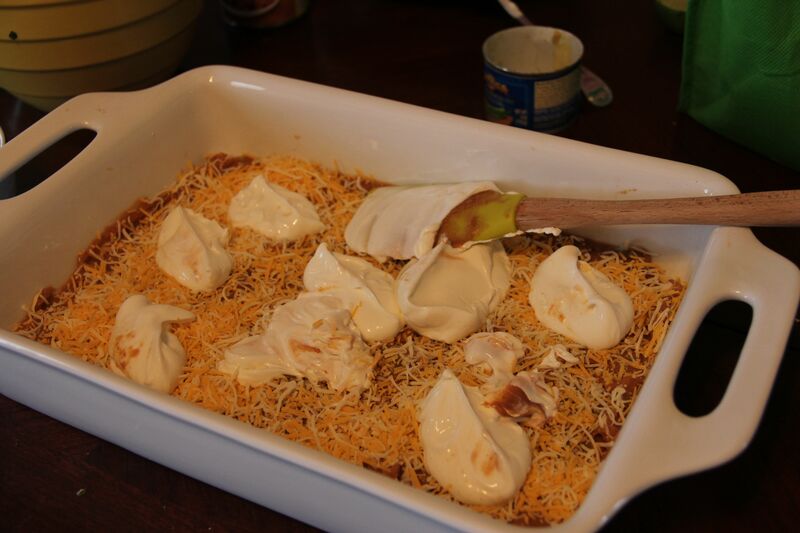 This next layer is typically sour cream, but I used plain Chobani Greek yogurt. I’m not trying to pass this off as a healthy dish (that’s kind of a hard sell when you’re working with this much cheese) but using Greek yogurt instead of sour cream makes a big difference nutritionally without really affecting the taste too much. Plain Chobani yogurt has a similar texture and tanginess (probably not a word) to sour cream and it’s hard to pick out the difference in a dish like this that has so many flavors. If you’re not completely sold, try using half sour cream and half Chobani. 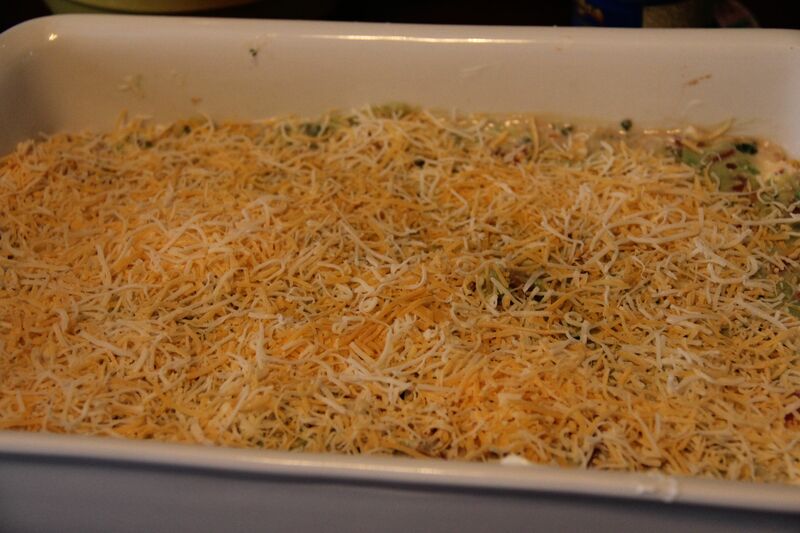 Stir the yogurt or sour cream to soften it up and then plop a few spoonfulls over the cheese layer. Carefully spread the yogurt using a spatula. The next layer is guacamole (also found here). 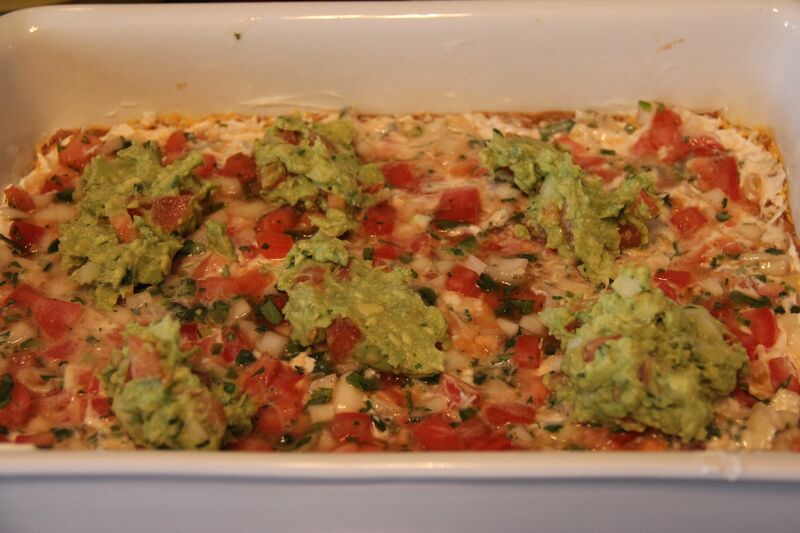 Keep in mind that guacamole goes bad quickly, so this is a dish that is best enjoyed the day that it is made. 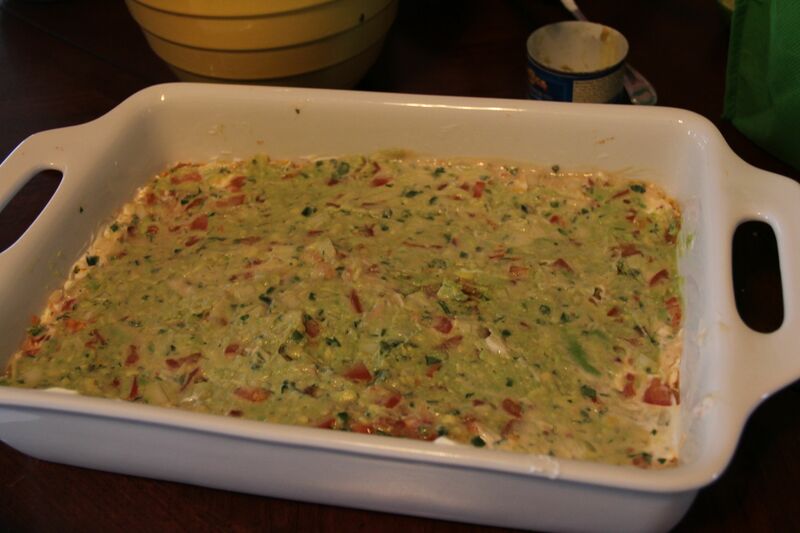 If you wanted to make this dip in advance, just omit the guacamole layer and toss the rest of the dip in the fridge. Then you can make the guac right before you’re going to enjoy the dip and serve it in a bowl on the side. and spread it with a spatula. and finish it off with sliced black olives. There you have it! Serve with tortilla chips (I recommend sturdy ones) and enjoy! 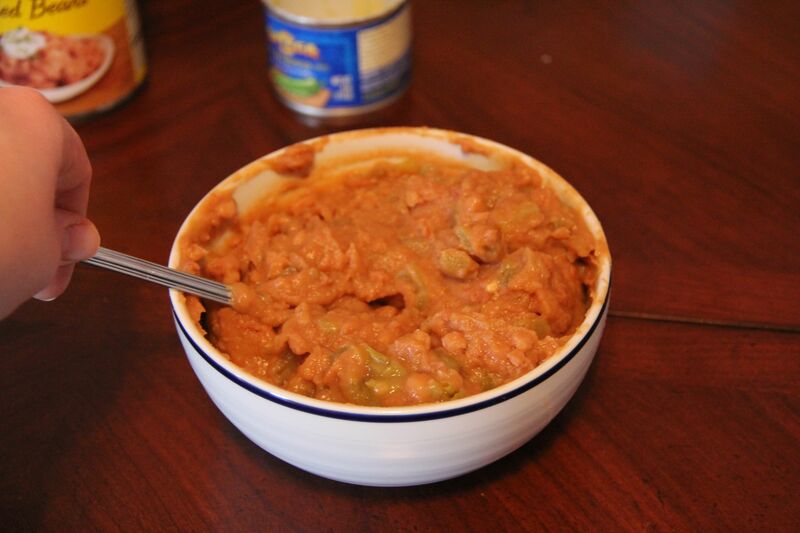 Combine refried beans, cumin and green chiles and spread on the bottom of a shallow container with a spatula. 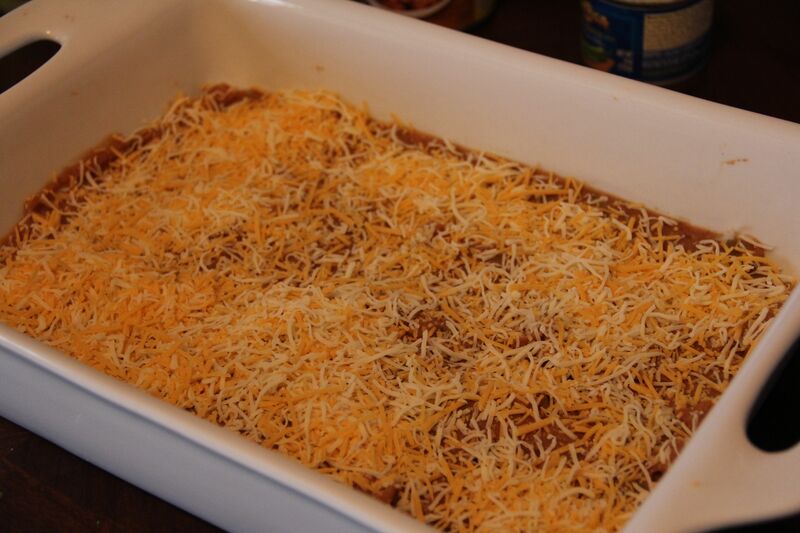 Combine the Cheddar and Monterey Jack cheeses and sprinkle half evenly over the bean mixture. 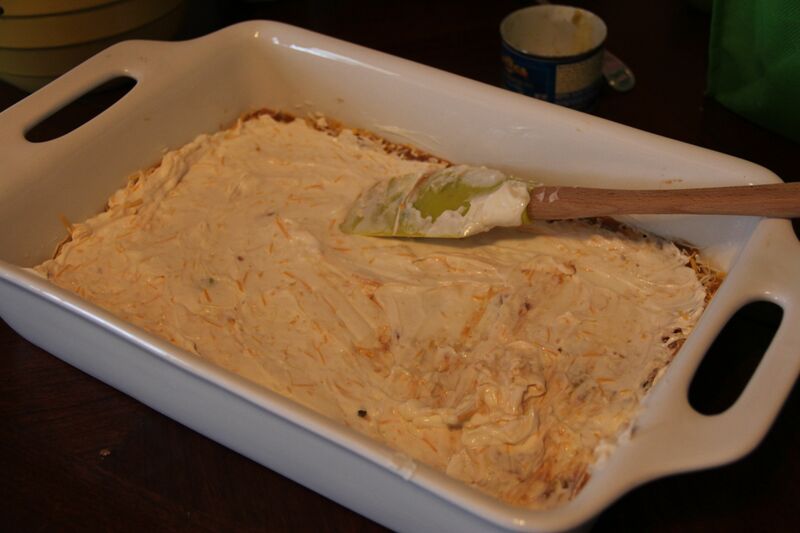 Stir the yogurt to soften it, drop a few spoonfuls onto the cheese layer and spread evenly with a spatula. 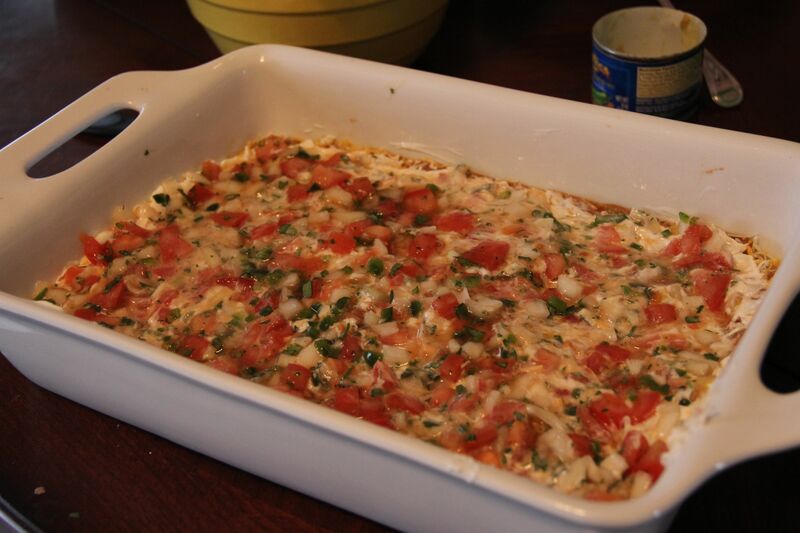 Spread a layer of Pico de Gallo followed by a layer of guacamole. 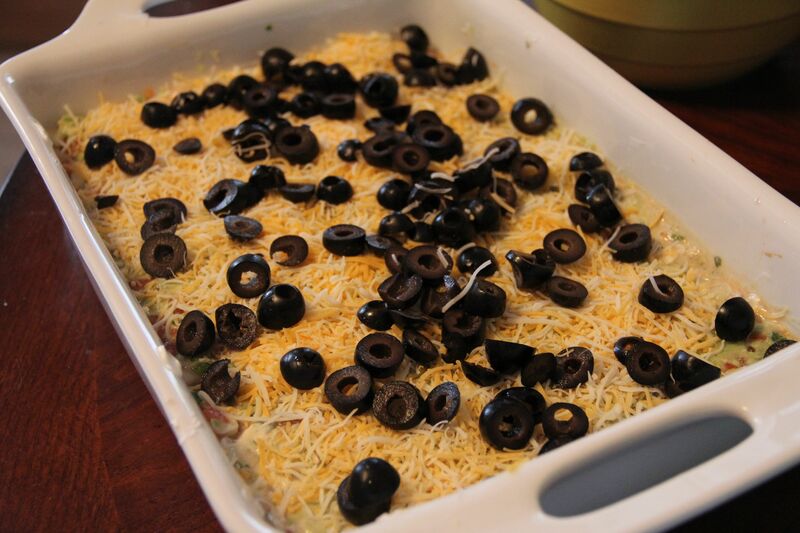 Sprinkle the remaining cheese over the guacamole layer and finish off with the sliced black olives. Serve with tortilla chips. Yummy ! Looks like a good super bowl snack a roo….! Who’s that super team??? Oh yes…Go Patriots! It sure is! Can’t wait for Sunday! Ooh man, it is! I have to stop myself from just making it for dinner instead of for a party. Delish!